During a spring of intensive public outreach, the Northern Virginia Transportation Authority (NVTA) gained insights from over 1,300 individuals – around 1,000 at in-person events and over 300 via web survey— on how they currently travel and what their desires and expectations are for the future. These, and other findings, are helping guide the NVTA’s update of its TransAction 2040 long-range transportation plan. 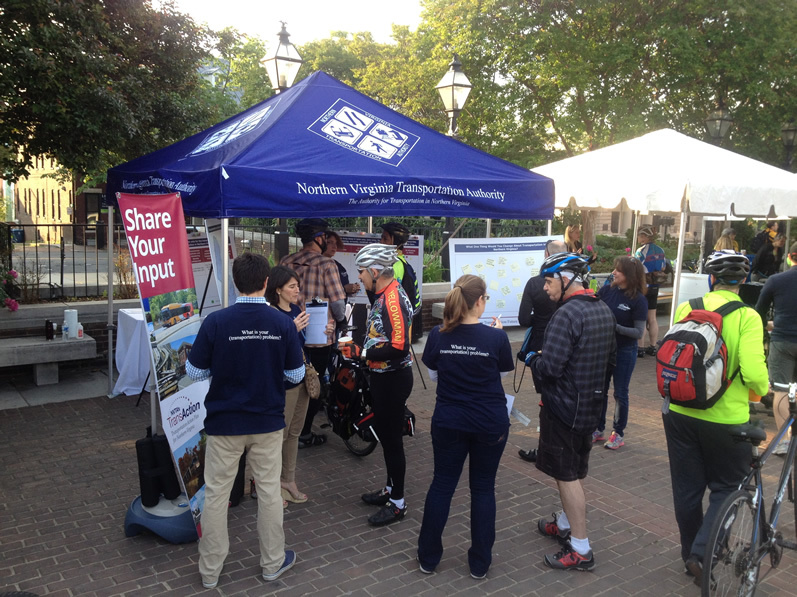 The NVTA engaged the public at 17 pop-up events and workshops from April through June, the majority of which involved appearing at public events that turned out large numbers of Northern Virginians. The outreach effort was geographically dispersed and designed to elicit input from varied segments of the population. The calendar of events included the Lorton Springfest, Bike to Work Day in Alexandria, the Falls Church Memorial Day Parade, the Manassas Heritage Railway Festival, Metrorail stations, and other venues. By appearing in a high-profile manner, with a branded tent, banners, and uniformed project team members, the NVTA public outreach effort made it easy for residents to participate and voice their opinions. Asked what potential scenarios would have the greatest impact in reducing congestion, the largest percentage of respondents (49 percent) –at both pop-up events and via the web survey –cited decreasing the need to travel for shopping or work. Other potential trends cited by the public to reduce congestion were higher driving costs (19 percent), increased ridesharing and more autonomous vehicles on the road (16 percent), and more transportation information technology (13 percent). When asked how to prioritize future transportation investments, the most common response was to increase access to the transit network as well as increase its service area (24 percent). Other responses included improving transit service, reliability and safety (13 percent); adding capacity to highways or reducing congestion (13 percent); and improving policies or funding mechanisms (10 percent). In addition to pop-up events, formal public workshops were held throughout the region. The workshops allowed residents to give detailed feedback regarding the region’s transportation network and five future trends. Additionally, they provided a forum for certain population groups, such as seniors and minorities, who typically do not take part in public participation processes in large numbers. 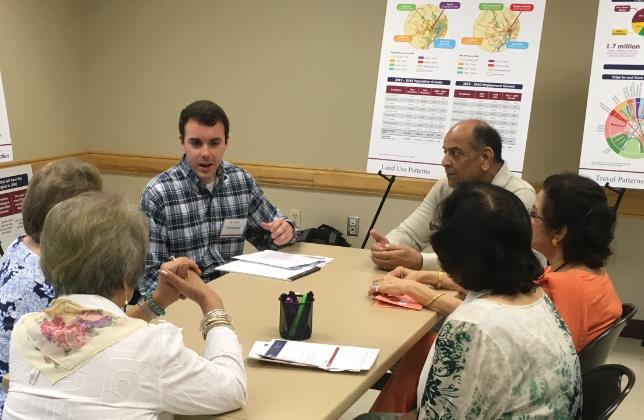 Giving these groups the opportunity to express their views enabled the NVTA to obtain input that reflects the diverse population of Northern Virginia. Time: Northern Virginians’ value their time and with increasingly flexible work hours, pedestrian and bicycle trips throughout the day will increase and should be prioritized. Those that were unable to attend in-person events are invited to visit the website (nvtatransaction.org) to voice their input. After incorporating the recent public input and refining technical aspects of the plan update, an additional wave of outreach will be carried out in the fall of 2016. The transportation plan update is utilizing the most current available data and employs best practices from across the U.S. and internationally. Additionally, it will model alternative futures to represent the ways in which rapidly evolving technologies could change the way people travel, as well as shape Northern Virginia’s future transportation network. The result will be a multi-modal vision for transportation improvements in Northern Virginia, serving as the mechanism through which more than $1.7 billion will be allocated to regional transportation improvements from 2018 to 2023. The NVTA’s spring outreach effort followed its fall 2015 release of a scientific public opinion survey of what Northern Virginians think about their current transportation network and what they desire for the future. The poll found that Northern Virginians’ top priority is reducing trip times, followed by making transportation services more affordable. Click here for more information about the survey results. A followup survey will track changes in public perceptions about transportation following a year of TransAction outreach. The NVTA was created by the General Assembly on July 1, 2002, to offer a common voice for Northern Virginia on transportation issues confronting the region. The Authority is made up of nine jurisdictions including: the counties of Arlington, Fairfax, Loudoun and Prince William; as well as the cities of Alexandria, Fairfax, Falls Church, Manassas and Manassas Park. The Authority is responsible for updating Northern Virginia’s long-range transportation plan, TransAction, and since 2014 manages approximately $340 million annually in public funds for transportation projects designed to provide congestion relief throughout Northern Virginia. For more information visit www.thenovaauthority.org.